TESDA offers FREE Online Courses For Everyone. No Age Limit. The government have noticed that a lot of high school graduates cannot afford to go to college and finish their education for a more decent future. Thus, this problem was meet and free TESDA's online college courses was created. The Technical Education and Skills Development Authority (TESDA) is now offering a FREE! 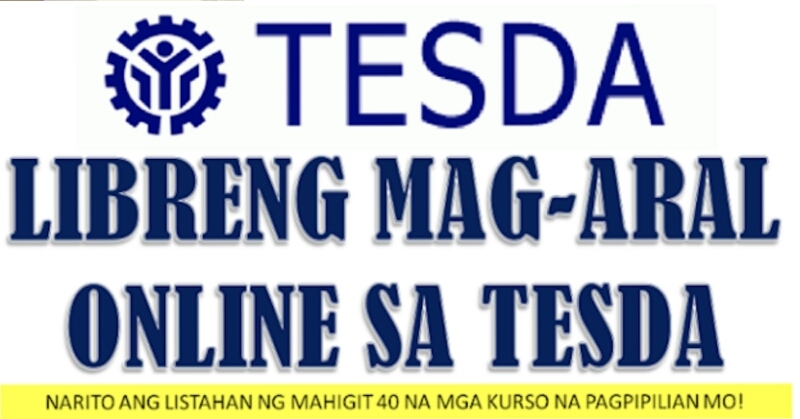 online course that let’s anyone learn online by simply registering to the official TESDA Online E-Learning Site. This is the latest free service (no tuition fee training) that the institution is offering to Filipino Citizens for the year 2018. With the help of the internet this program will make the skills development and technical education a lot more accessible to aspirants. TESDA's Asst. Dir. Jun Mamaril said that those who sign up with TESDA may learn the course at their own pace, as each course had no deadline or timetable for students to follow. Internet Connection, Laptop or Desktop or you can access it on an internet cafe in case you don’t have a laptop or desktop. There are still sub-categories on some courses just be sure to check the site and check all the categories. Interested applicants may create first a free account on TESDA Website . before enrolling to one of the subject. Students who will complete the course will be given a national certification for their efforts once they accomplish and pass an accreditation exam at any TESDA Centers. Many were glad that TESDA had implemented this E-learning Site for it will be a great opportunity not only for Filipinos here in the Philippines but also the OFW’s who can access as well, all the modules and materials online anytime they want. Step1. Go to tesda online program website e-tesda.gov.ph . At the upper most portion of the website you will find login link (you are not login). Go to that link. Step2. Start creating your account. Fill out the needed information in the given form. Then click create an account. A message will be sent to your given email address to activate your account. Step3. Once you have your tesda account you can now enroll to your chosen course. Login to your account. You will be redirected to tesda online program homepage where you will see the list of courses. Step4. Click the course you want to take. Step5. Courses are divided into modules. Choose link of the module you want to study. Step7. Confirm your enrollment by choosing ‘YES’ in the popup window. Step8 Congratulations you are now enrolled to your chose online program.